Niccolo Paganini landed his hands on the Il Cannone Guarneri after he has lost an expensive Amati violin due to his impulsive gambling. It was granted to him by an amateur violinist and businessman. After receiving it, Il Cannone became his only violin, and played it for years till his death in 1840. 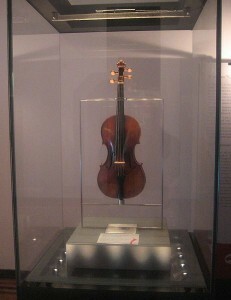 After his death, Paganini granted the violin to the city of Genoa, Italy and to be kept as a national treasure. An interesting story about the Il Cannone Guarneri was that a direct duplicate of the Il Cannone violin was created by Jean Baptiste Vuilaume, one of the greatest violin maker in the 19th century. His workmanship on the Il Cannone replica is so acute that Paganini couldn’t differentiate the original and the replica, until he noted subtle differences in tone when he played it. While it was just a replica, it had the privilege of being exhibited alongside the real Il Cannone Guarneri in Genoa town hall. This famous violin was handled with care and was played monthly by its curator, to maintain its playability. The Il Cannone is also played each year by the winner of Premio Paganini contest held for young aspiring violinists. Today, Il Cannone Guarneri is one of the most popular violins played by famous violinists in the world. Violinists have performed in concerts with the Il Cannone. Jazz violinist Regina Carter even recorded an entire album played with the Guarnerius violin, titled Paganini: After a Dream. Thus far, the Il Cannone has not been known for being sold in auctions, but what’s sure is that it is being insured with US$4 million in Genoa, Italy. Having just been readng about the colourful life of Niccoli Pagagnini it was really well appreciated to find a well written feature on his violin – of special interest to myself as a collector of violins (albiet somewhat more modest ones than this astonishing instrument). A question that has come up for me recently and that I am yet to arrive at a satisfactory answer for is why is it that Stradavari such a well known name and yet Guaneri only really known of within the world of people who take an interest in violins. I would agree with you that Stradivari is a better known name than the Guarnerius, and that is also what puzzles me till today. To the many experienced violin performers and tutors I talk to, most of them know both models of violins, and each model suits different kind of violin music. They love Guarnerius violins for their mellow and thicker voice.